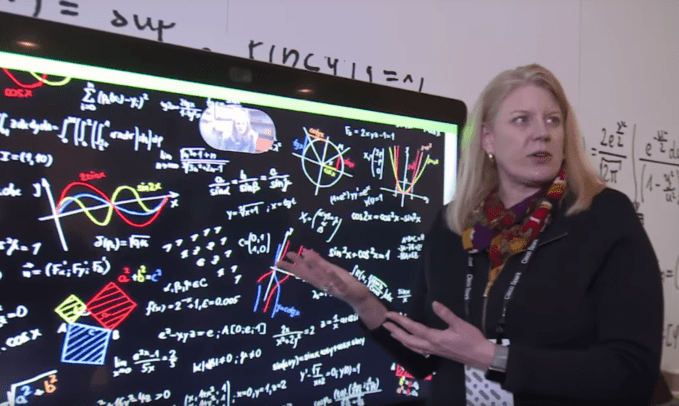 Yesterday I wrote about Cisco’s next big announcement for their Spark platform, with the Spark Board and Spark Meetings, and this really is one of the coolest products I’ve seen in a while. After the announcement, I also had the chance to get some hands-on time with the Spark Board itself and really gain a feel for what the experience is like – and it seems to be a great one. I’ve even had the chance to use the Spark app even more and play around with some of the new Meetings features that go along with the Board. 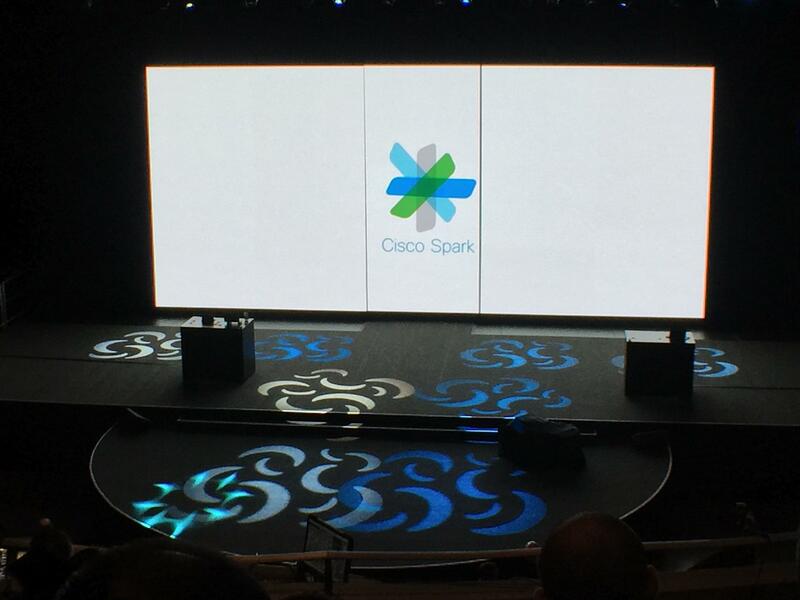 I originally said Spark felt like more than just a chat app, and Cisco keeps making changes to ensure Spark offers an experience no other team collaboration solution does. 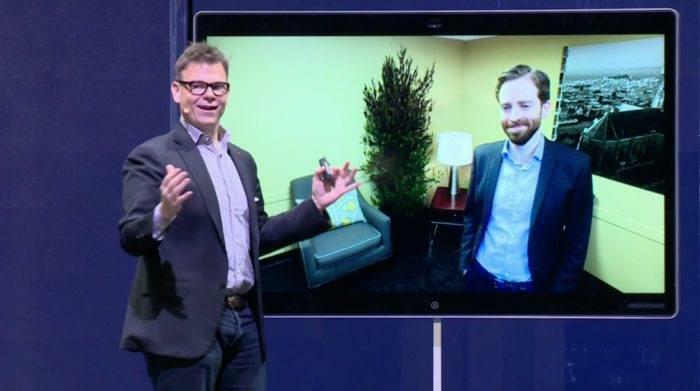 Kicked off by CEO Chuck Robbins, led by Rowan Trollope, and demo’d on stage by Jonathan Rosenberg, Cisco put on quite a show to introduce their newest product, and it really illustrated how excited they were to bring an idea like this to the market. 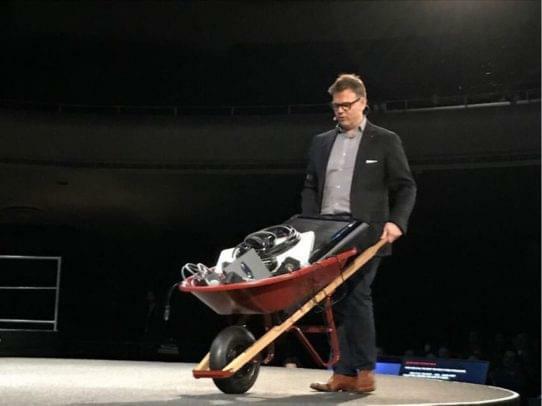 Rowan had a great moment on stage when he dumped an entire wheelbarrow full of just clunky and pretty awful tech that we currently use to collaborate – an old jumble of cables and outdated hardware. With a rat’s nest of cables, as he described, clunky sound bars and microphones, huge cameras and webcams sitting on one corner of the stage, the Spark Board emerged from “behind the curtains” so to say, to take center stage. There was a clear parallel between what Cisco considered the past, and the future of collaboration. We were walked through demos of the board with live video calls on stage, made calls off his phone to show deep integration with Apple, and had plenty of fun showing off the whiteboard function too. 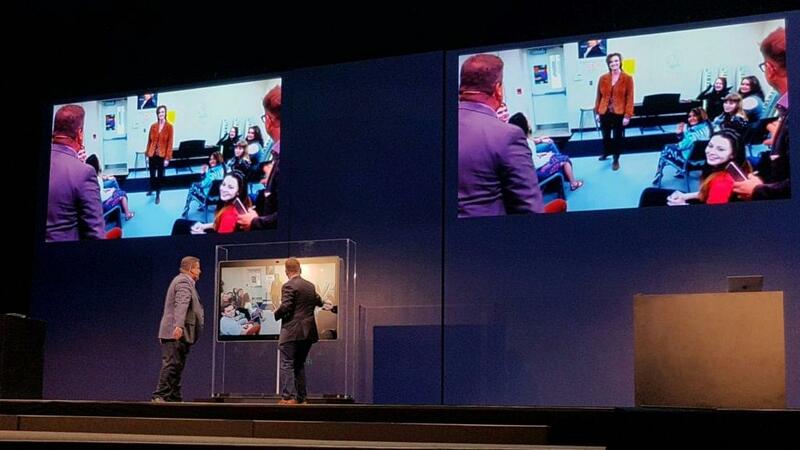 To really show the board in the real world, we were visited by a couple of customer examples from Verizon executives who both use and sell Cisco solutions, to a leading interior design firm with only 30 employees, and even a music class, whose teacher we connected with on stage. We learned about how the class uses Spark to collaborate even after school hours. After Rowan announced a surprise Spark Board was installed in his classroom, where his wife and co-teacher was waiting with his students, we were given a great real world example of how the Board will foster collaboration in a new way . The entire audience and Spark team had a live 4k video conference going on with this music class. Cisco demonstrated a whiteboard display that contained a melody to sing along, and space for those on the stage with us back in San Francisco to fill in missing lyrics. Jonathan Rosenberg did a great job of outlining the intense encryption and security in not only every Spark message, but also in every single little line you would draw on the whiteboard. Jonathan also explored the idea of why there’s a need for a solution like Spark Board in the current market. 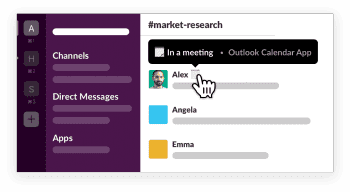 With a list of common meeting pain points, and a breakdown of meeting types from “occasional messaging,” and “furious chat,” when the entire team is quickly going back and forth in Spark or Slack, to ad-hoc meetings and scheduled meetings. The Spark board is really a 3-in-1 solution that kind of does it all, and the entire user experience is really impressive. The team kept repeating simplicity, simplicity, and simplicity. Current solutions are really big and expensive, and we’re forced to piece together a system with a TV, a nice fancy camera, an expensive sound bar — all of the tech dumped on stage. This “build your own” paradigm is not only annoying and complicated to setup, the overall experience is pretty much just awful. Compatibility problems, cabling funsion, and clutter can just lead to a clunky, in efficient experience. No one wants to use something that isn’t fun or easy to use, period. So the Spark Board itself was really the star of the show, of course. Spark the platform had some new features, mainly UX elements — well, also the fact that you can use the Spark Board digitally even if you don’t have a physical board — but the hardware is the key takeaway here. Essentially, the Spark Board is the hardware to drive an integrated, or as Rowan put it, ambient computing experience. 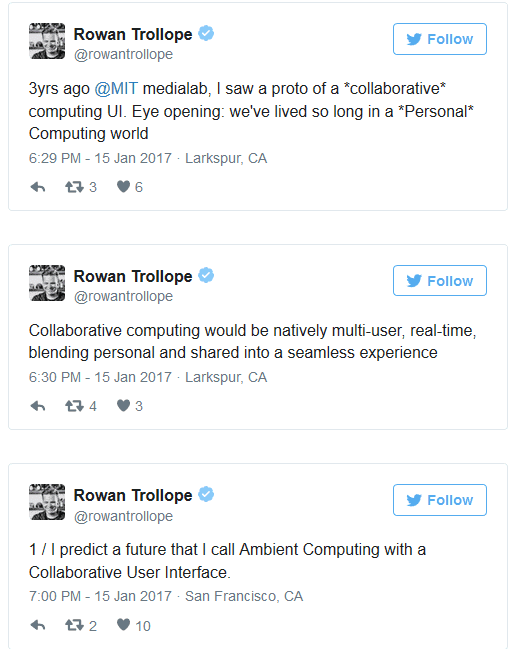 Speaking of which, prior to the announcement Rowan put out a string of tweets in which he discussed the idea of Collaborative, or Ambient, computing. We currently have personal computers, with personal interfaces in which we interact – but what about a shared interface? How do you keep it secure, private and personal while also allowing a shared experience? What about the “ambient” aspect? The concept is that computing should be always on and always around us. With the idea of simplicity in mind, we shouldn’t have to pair, or connect, or hook up devices — everything should just automatically recognize each other, and pair without the need to pull out a phone and open up a pairing menu. What was super cool to see, was that Cisco really managed create an experience of that nature.If the idea of the Spark Board itself doesn’t impress you, then the underlying tech should. 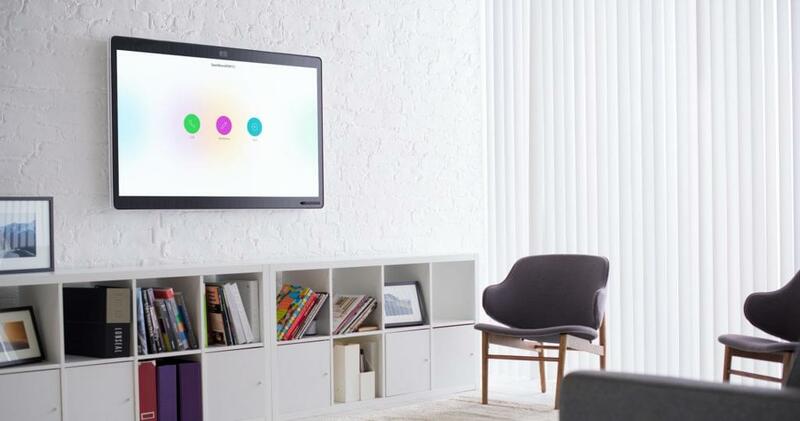 What is essentially “proximity pairing” allows the Spark Board to recognize when a user steps in the room, instantly greets them, and allows the user to access their files, contacts, teams, messages, calls, or whatever. While this does work based off your mobile phone with the Spark app installed, you don’t need Bluetooth, you don’t need to type in a pin or access code, you don’t need to pair, or sync, or manually add in users. We’re not really sure on the secret sauce here, but Rowan made a point to say the marriage between user and board is easier than pairing Apple’s Air Pods to an iPhone. An array of microphones along the top of the Spark Board hidden behind the bezel allow for pin-point accuracy in recognizing and focusing on the active speaker. This microphone array, and the machine learning powering it, can sight in on an active speaker while attempting to mute background noise. We’ve had cameras that look for and focus on active speakers, well now we have microphones that can do it too. Machine Learning on its own is a huge aspect here as well, and does more than just power the microphone array. Deep iPhone integration allows users to make Spark calls from their phone, right in their usual contacts app like any normal call or video conference, and even lets users simply swipe the off their phone onto the board itself. All those fancy digital boards that have been littering TV and movies for years are start to really come to life. 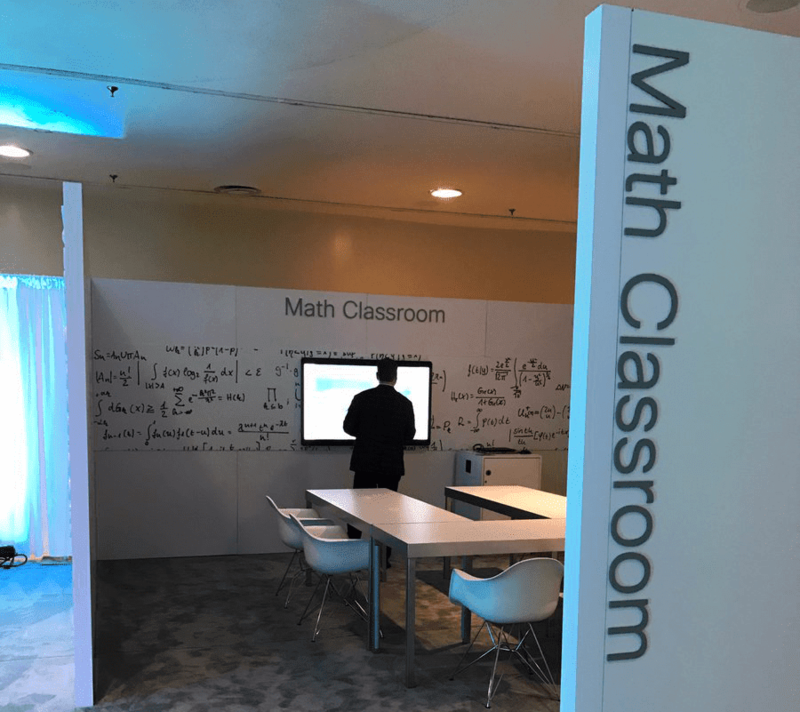 I actually wrote about Cisco’s iPhone integration and Apple partnership back when I attended Cisco Live, so it’s cool to see how far they’re taking it. This can also be done on Android with some of their public APIs, but the real partnership was with Apple. Since its all of this is based on the cloud, and the Spark platform, everything you do is consistent on devices, constantly saved, hosted in the cloud, and accessible anywhere on any device. Since this is Cisco, all data is also deeply encrypted for incredibly secure communication. Everything is encrypted so that even the Cloud itself cannot see your messages, calls, and anything else, down to every individual line you draw on the White Board. That’s right, each line you draw is treated as a unique message and encrypted individually. I also wrote about this last year back when I sat in on a Spark discussion during Live. So I did say I had a chance to use the Spark Board hands-on, and it was a really great experience, honestly. The board itself is a really well designed piece of hardware, there’s absolutely no denying that. After the demos I had the chance, with other reporters and analysts, to sit down with some of the team specifically: Jonathan and Rowan, along with a few Cisco customers. One question that came up was if the design was contracted out, or if Cisco asked Apple for any assistance or insight. The interesting answer was that everything design wise was done completely in house. Good job Cisco. 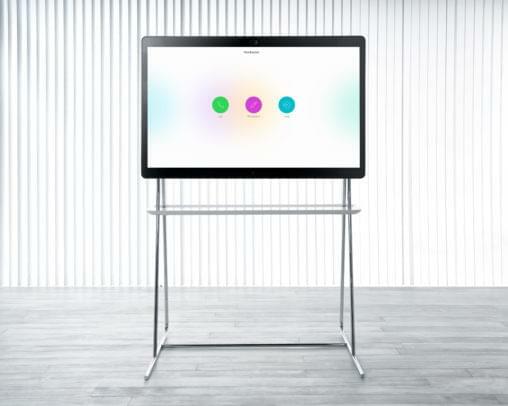 Overall, the Spark Board was described as “tablet for your team, that sits right on the wall.” And that’s really the best way to describe it, it works like a tablet, feels like a tablet, looks like a big tablet. Of course, it’s using Cisco’s Spark platform as the operating system, and that’s what separates it from being just a big tablet. The Spark Board is the hardware to complement the software that is the Spark Platform. Playing with the board, I had a chance to write on it both with my finger and the beautiful stylus they designed — the actual invitation Cisco they sent us — browsed through different files, had a chance to play Where’s Waldo (a great demonstration of the usual zoom and navigation finger gestures we’re used to from our phones and tablets) and had the chance to sit in on individual demos for different use cases from Movie Production to Fashion Design, Music Class and even Math Class. Here you can see our conversation with the “Movie Executive” and a team member redesigning a story board slide. Each of the demos ran us through a real-world scenario with how the board will make real time collaboration quick. 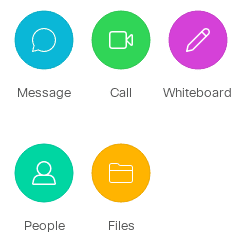 Seamless video calls allow users to display the whiteboard with a quick video preview at top to see our other participants, or full screen video calls, or a big prominent white board display with a small chat box on the side. So How Big Is This Really? Honestly, only time will tell, and I think even Cisco knows it’s a bit of courageous move in to launch something like this. They’ve certainly been priced it to sell as there really isn’t a product like exactly like this, at least not at this cost. Equivalents are generally far more expensive, and don’t have the unique Spark platform powering them. Cisco is going to securely monitor how boards are used – they won’t see your details and content, since they encrypted it in the cloud so they can’t even see it, but they will watch how users use it. 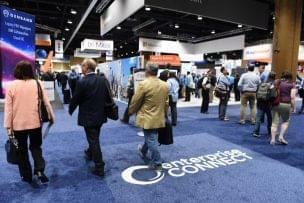 For example, the kind of data Cisco will collect looks at how long it takes for someone to interact with a board once they walk in a room, or how often and long video conferences are, or if the whiteboard gets used and what about it. They’re looking to collect data to learn how to build, and grow and continue to evolve. 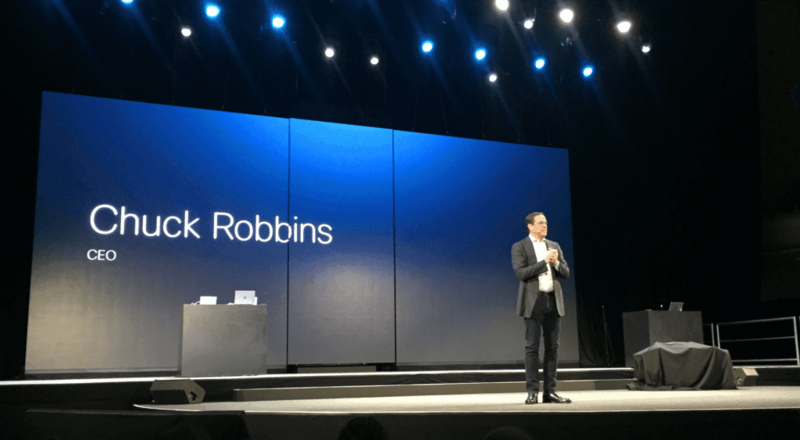 Rowan himself said that “this is the first announcement of a long innovation pipeline in 2017,” and Cisco wants to make sure they do it right to keep building off the basis they’ve started. Rowan also gave the example of an iPhone, when it first launched we didn’t have the capability to share and construct apps like we currently do, with such a massive market, but once Apple saw the device was a success, and being used, they ran with it and built something amazing – I’m generally not the biggest Apple fan and even I will admit that the iPhone is a great innovation. 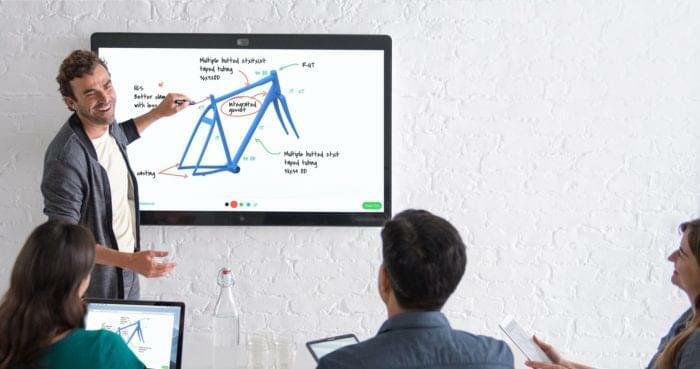 So far, the Spark Board really looks like it could be something similar, another great innovation in the world of Collaboration. The nerd in me is really, really likes the Spark Board – it honestly is just a cool piece of hardware, with some powerful software behind it. I’m definitely interested in seeing where they take it, and what’s next to come. Thank you for sharing this information, quite interesting. On a side note, please check your grammar, punctuation, and spelling. A spell checker would not find the incorrect word usage, thus there are many mistakes. Some of them make a paragraph difficult to understand. The good news is your article is highly informative. Thanks for the kind words! I appreciate the insight, and went ahead and cleaned up any confusing errors.